That Uncomfortable Word — Conviction! is now available for purchase as Kindle e-book. 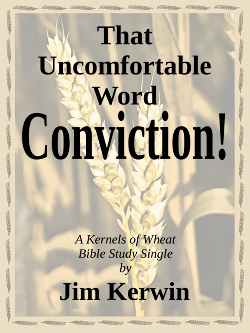 Cover credits for our Kernels of Wheat Bible Study Single series go to friend Steve (“Mr. Photoshop”) Bryson for the design, and my wife, Denise Kerwin, for the photograph used. All I have to do is provide the title and author text for each month's cover. Next month's Kernels of Wheat Bible Study Single will be Percy Gutteridge's The Gospel of the Glory. The paperback of the new edition of The Rejected Blessing only has to jump one more hurdle before it's available, so it should be on sale on or before October 5th. I'll make the announcement here first. By the way, friend (and graphic artist) Murry Whiteman (MWArt.net) did an eye-popping job on the book's cover, finishing it just last evening. Can you say The Rejected Blessing in Spanish? It comes out as La Bendicion Rechazada. Guatemalan friends, Pastor Fermin Chávez, and his wife, Pastora Lilian de Chávez, tell me that the translation will be available by early next week. ¡Gloria a Dios! Lord willing, we plan to have paperback and e-book versions of the translation available before I return to Central America next spring. Ann Gutteridge has just delivered the transcript of Pastor Gutteridge's sermon Earth's Most Powerful Preacher, which means that message is now on track to appear on FinestOfTheWheat.org by late December or early January. Ann has also started work on another message, Jesus, Our Great High Priest and Intercessor (yes, I was listening, Jorge Pérez, but we can't translate it until we transcribe it from audio), while friend Dave Armstrong has volunteered to transcribe a related message, Melchizedek. This latter message, our September 2012 Grains from Gutteridge podcast (Grains from Gutteridge #13), has been downloaded so many times in just three weeks that we decided it needed to get into print as quickly as possible. The Lord has been awakening me an hour early each morning for the last three weeks and encouraging me to write during that quiet sixty minutes. Thus, progress is finally being made on the manuscript of The John the Baptist Experience. There's hope it will be ready in 2013. 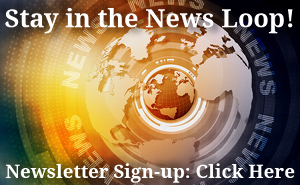 Next post: 023 Kernels of Wheat — Will the Real Antichrist(s) Please Stand Up?